Joe began his career in the Postal Service in January 1995 and was assigned to work at the Holmdel Post Office. He joined Branch 38 on his very first day of carrier training. Joe was active in union activities from the beginning of his postal career starting with working on COLCPE (Now Letter Carrier Political Fund) in his office starting in 1997. In 1998, Joe was a delegate representing Branch 38 in Las Vegas for the 1998 National Convention. In 2002, Joe was appointed to represent the letter carriers of Holmdel as a shop steward. He was subsequesntly re-elected and has remained the shop steward for the Holmdel letter carriers to this day. 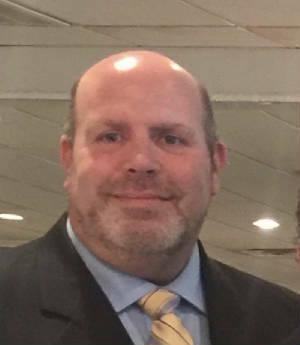 Joe has worked for both the Central Jersey District (2008) and South Jersey District (2009-2017), working to protect letter carriers in several route adjustment processes and route inspection. In 2014 Joe was appointed by Branch 38 President Pete Maglio to represent Branch 38 as a Part-Time Area Representative. Joe graduated from the NALC Arbitration Advocacy Program Class in November 2018 and is now working on arbitration cases for both Branch 38 as well as NALC Region 15. He was elected by acclamation to the position of Trustee, assuming that position in 2019. He spends part of his spare time with his two grandchildren, McKenna and Liam.